Yesterday, we were amongst the first to report on the WWDC 2011 event’s official schedule announced by Apple. The event is scheduled to start from June 6th at the Mascone West in San Francisco, California. Apple utilizes the event to connect with its third-party developers while also unveiling new developments on the other hand. 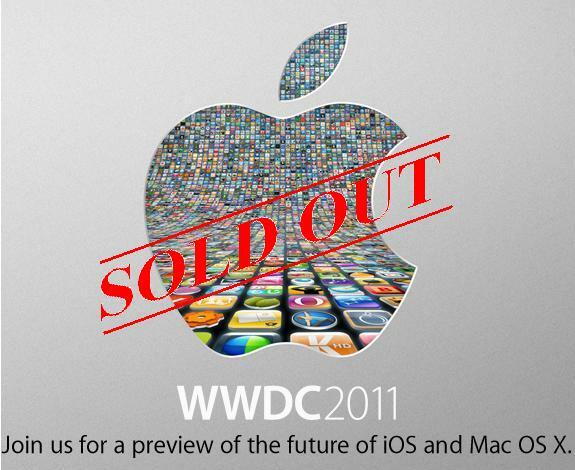 For those, looking forward on buying tickets for WWDC 2011 should stop the hunt, as the official website announced on a total sold out. Less than 24 hours since the event’s announcement went LIVE, Apple witnessed a strong demand with participation from almost all. This year’s event would focus on both, the software and the operating system. And how could have anyone missed it with the announcement revealing all. Eager developers and fans bought tickets in what is tagged as a record, less than 24 hours.